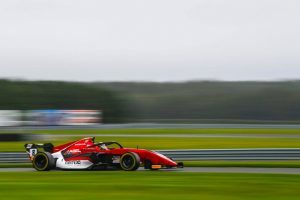 Kyle Kirkwood won two out of the three Formula 3 Americas races at New Jersey, but defeat to Baltazar Leguizamon ended a 19 race victory run. Of the 19, 11 came in his title-winning USF2000 title campaign, with the remainder coming in the first eight races of the inaugural F3 Americas season. The New Jersey weekend started with a free practice session only contested by Global Racing Group driver Leguizamon, but the extra experience proved to be of little help as he was beaten to pole by Kirkwood by 1.3 seconds. United States Formula 4 regular Jacob Abel qualified third on his debut, joining Kirkwood at Abel Motorsports. The first race was similar to qualifying, with Kirkwood dominating, Leguizamon finishing second and Abel beating Southern Motorsports’ John Paul Southern Jr to the final podium spot. The result immediately lifted Abel to fifth in the standings. Leguizamon was unable to make it to the podium as he was doubling up in the Atlantic Championship. Former Atlantic champions include Gilles Villeneuve’s younger brother Jacques, Michael Andretti, Scott Goodyear and Simon Pagenaud. Leguizamon became the latest name on that list with victory in the first race. Leguizamon went from hero to zero in the second F3 race though, going off at Turn 1 and dropping to the back of the four car grid. He then had a lengthy pitstop, putting the Argentinian a lap down. This left Kirkwood completely unchallenged, with the 19-year-old taking victory number eight by 48.485s over Southern, who took his best result of the season after a close battle with Abel. A three-place grid penalty for Kirkwood meant he started the final race of the weekend from fourth, with Leguizamon heading Abel on the front row. It didn’t take long for Kirkwood to get to the front, but Leguizamon fought back and took his and GRG’s first victory by just 0.923s. Abel completed the podium, with Southern failing to finish the race.